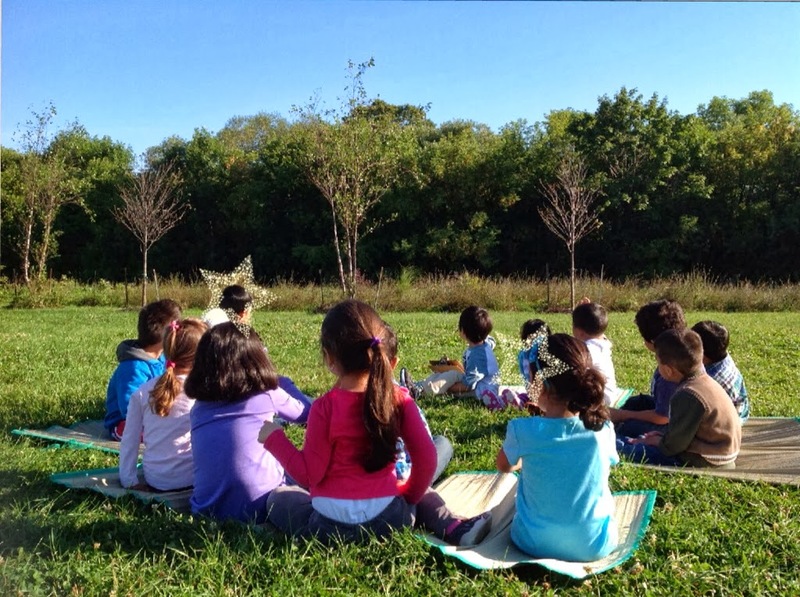 A first week afternoon class welcome meeting: singing songs, making friends, dancing, watching for butterflies. This year has been a wonderful, exciting, busy time in our class. It started before the students came back, when we teachers learned about the impact of the big flood in July. Our school was flooded, the first floor left with silt and mud, and as such, our carpets destroyed. We teachers were grateful to those who worked so hard after the flood to clean the school, but we were also concerned. New carpets were ordered but would take several weeks to arrive. What seemed like an insurmountable problem ("How can we have carpet time if we don't have a carpet?") instead sparked something new, something quite wonderful for us in room 109. I purchased roll-up grass mats, the sort you take to the beach. My teammate and friend Ms. Croft brought in large foam tiles to create a soft square for seating in her class, and gave me a stack too, which was a lifesaver on rainy days when we couldn't head outside for meeting time. But for all the other days, the beautiful, sunny days of early September, we started our day together outside in the meadow beside the "no-mow zone". I don't think I've ever had a September quite like this in my ten years of teaching Kindergarten. Goodbye tears disappeared quickly each day as we tramped off over the grass to find a spot to lay down our mats. We greeted each day with our "jumping song" and the butterflies and dragonflies buzzed around us as we sang and danced together. We chased and captured insects to view, and later release. When we entered the classroom after meeting time, it was time to explore and play, freeing me up to spend time with new students on their first days. Relationship building is the most important part of any Kindergarten classroom in September, so this ability to enter the class and move directly to "play and learn time" (the students' chosen name for our free-choice exploration time) has made creating a classroom community much easier this year. I wonder now if all those years, starting out our day at carpet was difficult for nervous new students, surrounded by inviting materials and toys and yet not allowed to touch them while we sat in a circle, all close together. A welcome circle during the first week, before all new students had arrived. 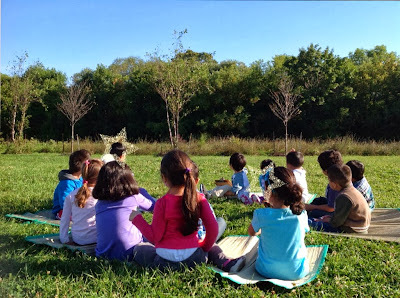 Morning class looking at dragonflies which flew in circles over us and then into the long grass area behind us known as "the no-mow zone". Last year when I started this blog, I was well into the year with my students and had seen several inquiries build and wane by the time I chose favourites to share. Now since the beginning of this year, intent on forming relationships and building the social structures a class needs, I've watched as friendships were formed around shared interests: three friends creating a track for trains, six friends creating a bey blade arena, five friends catching ladybugs and watching them closely in the "bug jug", four friends exploring colour and shadow in the light centre. Several projects have sprouted and begun to grow (that is, explorations that grow and sustain a group of students for more that a week). One theme has tied them altogether, even though the children's interests are quite diverse. We have a way to explore our learning environment that helps us focus and learn more, by helping us to slow down and truly understand what we are learning about. We call it: "Looking Closely". 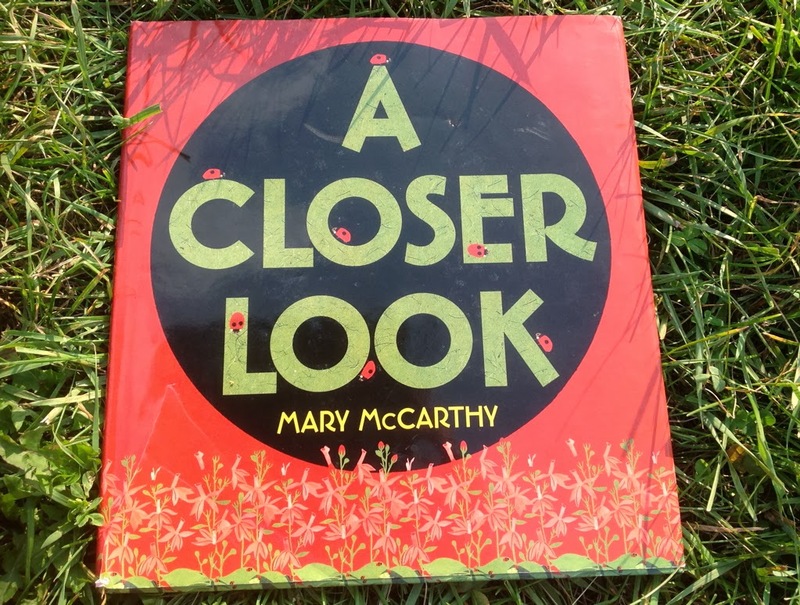 A favourite story shared outside: it invites the reader to look very, very closely to discover new wonders in nature. Now I didn't know this would be our guiding principal. Last year, when I was brand new at Thornwood and all my students were new to me, I made an effort to keep in touch with Miss Metcalfe, the previous teacher in our classroom. Her JK "caterpillar" students, now my SK "butterflies", loved to hear about their teacher in her new school. This was one of many connections we made to classes outside of our own over the year. Making connections was the big idea that connected our projects. It allowed us to share our inquiries with others on the "We Can See" project blog, and saw us sharing materials and ideas with friends in other classes around our school board. By the end of the year my students were well-versed in social media sharing and had a concept of an audience who were interested in their learning. I expected that this would continue to be our big idea, and indeed the butterfly students are often the authors of daily tweets to families and followers. However, the intriguing "Looking Closely" collaboration formed this summer. Beach glass, water- and sand-softened. Marvelous on the light table, each piece unique. It started far enough back in the summer that I can't find the tweet. I shared a picture of some beach glass I'd washed, drying in a colander. 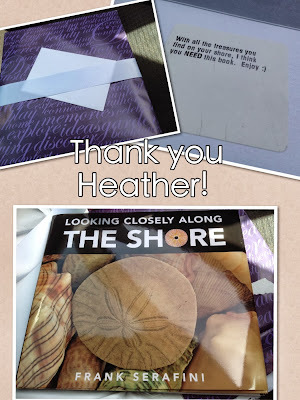 @HeatherMMcKay asked if it was truly from the beach, as she'd only ever seen it in stores. I decided right then to continue beach combing with my kids until I had a full mason jar, and send half of it off to Heather. (I've gotten good at finding it: sending fourth parcel this week). My daughter helped pack, write a card, and sorted out her favourite pieces (she says I'm not allowed to send the blue and red ones, they're very rare. I always try to sneak one in). Here is what I saw on twitter when it arrived: @KinderFynes IT ARRIVED! Thank you so much to you & M. I love it! 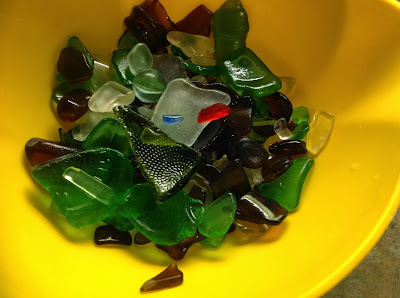 Can't wait to WONDER with my new Ss & sea glass! Although I told her the glass was a found "treasure" and therefore had not cost me anything, she insisted upon returning the favour by sending me a favourite book to inspire students. The book, pictured below, is one of a series of "Looking Closely" books which play with perspective and detail to draw the reader in. 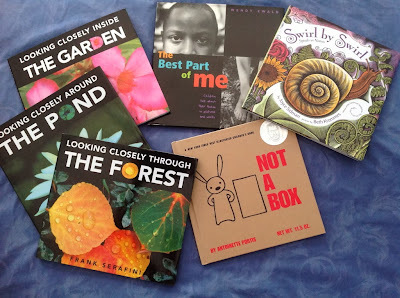 We were both so intrigued by the idea of using these books to inspire our students to slow down, look closer. 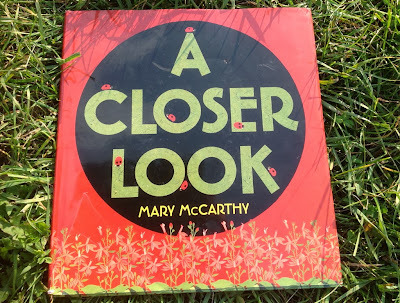 (click here to read the "Storify" version of the twitter story) Since that discussion and Heather's creation of the collaborative blog, many students, in Kindergarten and older grades alike, have taken part in a "looking closely" project with their class. Currently there are 30 teams participating and the enthusiasm continues to build! A quick thank you sent on twitter to let her know I'd received the book, and soon an collaborative inquiry was born. Excited to spark more critical looking at the world around us, I bought several more books from the "looking closely" series, along with other titles I remembered as inviting close inspection of everyday objects. In our class, we share our discoveries daily with our class twitter account: Beyond 4walls @FynesKs . Many exciting inquiries have developed around our habit of looking closely around us: followers on twitter can follow the hashtags to see our #treeinquiry and #lookclosely tweets, and several small-group projects have grown to include students in both classes. 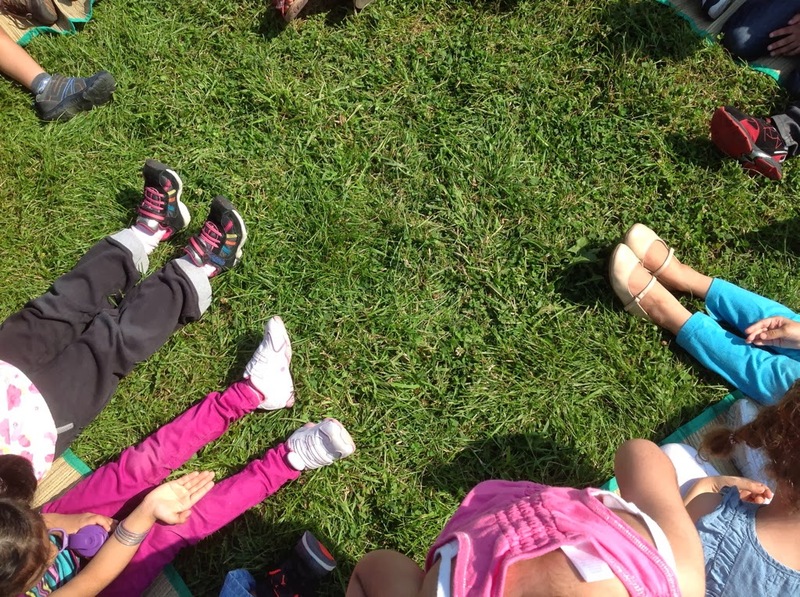 Our first post on the collaborative blog shared the story of how we look closely in the meadow where we begin our days. Ongoing interest in the little creatures we find in the meadow has lead to several small groups "looking closely at insects" and becoming experts at how to capture and release various insects gently and carefully. Several projects which warrant their own post here are currently underway in our class: looking closely at our adopted class trees as they change with the seasons, looking for circles, cylinders, and other round things, looking closely at insects, looking at structures in the building centre. several ladybugs among the wind-blown leaves. Some inquiry sparks burn bright and fast, leading to whole-class investigations that excite students, but the investigation may fail to continue in following days. Last week family followers on twitter could surely hear the buzz of excitement when our afternoon class, walking back from a visit to our class tree, found and captured a cricket. The observations and theories from students were amazing, and it was all I could do to keep up while writing their words. It was an incredible day of learning, yet a Friday, so it is entirely possible that interest will be gone when students return after the weekend. I will be sharing this afternoon's investigations on the Looking Closely collaborative blog, once I know if this is a finished story or merely another page in a growing book. Outstanding questions for me: Will all the sparks of interest turn into big, large group projects? Does it need to in order to be valid learning? Is it enough to capture the moment and reflect on it? What skills and attitudes will "looking closely" develop in students?